New listingRooster Pitcher Made In Italy Perfect Condition. Rooster Pitcher Made In Italy. Dispatched with Royal Mail 2nd Class. Unusual Deruta (?) Italy majolica tinket box, bugs and animals. Dispatched with Royal Mail Signed For® 2nd Class. Made in Italy by Bellini he is really rather unusual. Oozing Mid Century modern, he is a stunning colour combination of blue/aqua, with a funky 60's pattern. If we state an item to be from an era (i.e. "Victorian"), this will be a researched decision and we will be certain that we are correct. VINTAGE ITALIAN CERAMIC POTTERY MAJOLICA FROG TOAD GREEN GLAZE Florence? MARKED ITALY and its signed - possibly a Florence / Bitossi. IT'S A GREAT LOT THAT WILL ENHANCE ANY GOOD BITOSSI COLLECTION. BUT NEVER A SAT DOWN ONE. THERE IS NO APPARENT CRAZING. Otto Gerharz. He Set Up His Own Ceramic House " Otto Keramik " In 1964. Sadly He Passed Away A Few Months Ago, But His Son Otto Junior Continues His Legacy Still Producing Original Designs By His Father. Berardos Portugal Hand painted Decanter & Stopper. Animals & Birds Decoration. Berardos Portugal Hand painted Decanter & Stopper. Attrictive Animals & Birds with Foliage and Castles Decoration. Stopper has Cork seal. THE DECORATION IS MOST AKIN TO BOSSE'S MAJOLIKA WHALES, RATHER THAN HIS OTHER FISH. By CORTENDORF - circa. a few marks, typical with Cortendorf glaze. deep Red/Orange & turquoise. RARE CUTE CAT. 13 cm tall, 6cm wide and 11 cm long. Maker : Belgian Art Pottery. Place of Origin : Belgium. Roberto Rigon -. An Italian studio pottery model of a stylised lion. In excellent condition with grazing. Signed 'Zakarpatje'. The back foot retains its original paper label 'Made in USSR Zakarpatje'. 1960's - 1970's. 18 cm long x 18 cm high x 7 cm wide. It has a hollow centre and green and brown glazes. 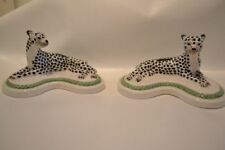 This is a super studio art Ceramic / pottery plate, hand made in Italy from the Animal World Series. Depicting a loveable pig in multi colours it’s a fab piece of modern studio art. It is stamped on the rear and also has recessed marks - please see photos. In superb undamaged condition with just very light wear commensurate with age. It measures just over 26 cm across and displays beautifully. As with all my art if you are not 100% delighted with it please return it for a full no quibble refund. An unusual Italian pottery bird bowl. The bowl is modelled in the form of a bird and is hand decorated. The base has 3 small feet and is signed 'Italy 4836' along with an artists mark. It does display well. 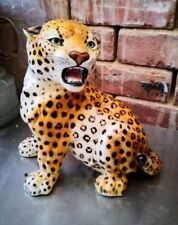 Art Deco Genuine Large lenci Favaro Cecchetto Porcelain /China Leopard (Italy). I know very little about this but This is a splendid piece. it is stamped under one of the paws but has faded a little with the number 1630. FULLY BACKSTAMPED ON THE UNDERSIDE WITH IMPRESSED ANZENGRUBER HAND MADE IN AUSTRIA. THERE IS NO APPARENT CRAZING. Roberto Rigon -. 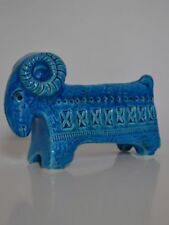 An Italian studio pottery model of a stylised water buffalo. In excellent condition with grazing. Condition is very good with minimal wear. Unusual model. 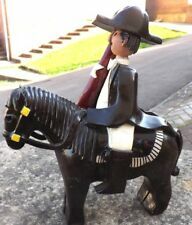 Possibly Spanish guy in uniform, on his pony/horse. A nicely detailed unknown Maker?. About 10.5" long 6 1/2” High (27cm x 16cm). Bought in West Germany in 1952, this antique decorative earthenware carriage originally held a chocolate Easter Egg filled with chocolates. The 2 animals pulling the carriage are does (young deers) ('doe a deer, a female deer'! ).